While this simple and delicious recipe is just a side dish, its golden crown and rich aroma will make it the center of attention on your dinner table. Coated with fragrant spices – including the powerful healing spice turmeric – and then roasted until tender, our Whole Roasted Cauliflower recipe makes the perfect accompaniment to Tandoori Chicken and other classic Indian dishes. Not only is this unique recipe a great comfort food, the combination of cauliflower and curry fights cancer, according to recent research. While this recipe is sumptuous (and packed with antioxidants) when using Indian spices, you can also make whole roasted cauliflower with any of your favorite spices for a different twist. Try smoked paprika (and top with crumbled blue cheese just before serving for a smoky-cheesy flavor), mustard and dill for a Scandinavian twist or chili powder, oregano and cumin for a Mexican-inspired side. Preheat the oven to 400 degrees F. Grease a small baking sheet with coconut oil. Trim the base of the cauliflower, removing the woody stem and green leaves. In a wide medium bowl, combine the coconut milk with the salt, pepper, spices, lime zest and juice. Holding the cauliflower by its base, dunk the cauliflower into the bowl, using your hands to coat the entire head. Place the cauliflower on the prepared baking sheet. Transfer to the oven and roast 40 minutes, or until exterior is dry to the touch. Let the cauliflower cool slightly, then slice into wedges. It did send I guess, as it tells me awaiting moderation. It went so fast I never got around to checking my letter for typos. Will fix the typos now, I hope. I clicked on to get your newsletter & a free report. The thingy to show it is sending went round & round & round, etc until I just lefT THe page. Further on I saw where I could get 2 or 3 free reporTs if I signed up. Same story, round & round it goes, but if it sent no one knows. 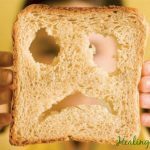 If you have further issues, please write to us at info AT healinggourmet dot com. Thanks for this cauliflower recipe. I just made it and it is a great way to fix cauliflower. Regarding the length of roasting, the summary shows an oven time of 60 min but the instructions proper show 40 min., which is what I followed. It was still a bit firm after 40 min but we ate it anyway. So, is 60 min the intended goal for roasting? If so, maybe the instructions can be altered to reflect the longer time. We liked the seasoning even with the strong turmeric flavor. An excellent recipe; we will be making it again. However 2Tbsp of chilli powder seems excessive; we cut it to 1/4 tsp. The ingredient list does not mention lime zest. How much lime zest should be used…? Thanks, Glenn! Good eye. It should be 1 tsp. and the recipe is updated.